A Santa Diaries’ Kid Goes to Carnegie Hall | Does This Font Make Me Look Fat? One of the things Laura and I loved about watching The Santa Diaries play unfold was seeing the talented kids who were part of the show. One of them was Hannah Zerai who blew us away when she auditioned. Only fourteen, Hannah had an incredible voice. Two days ago, when I opened our local paper, there was a photo and article about Hannah. Hannah had auditioned with more than 6000 students from the United States, Canada and other countries for the American High School Honors Performance Series at Carnegie Hall. She was on of 265 students selected to perform in the choir at Carnegie Hall in New York. Wow! 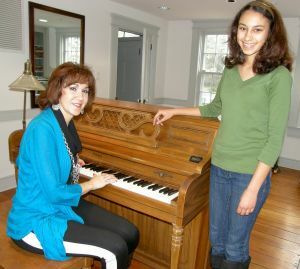 Two years ago Hannah began taking voice lessons with mezzo-soprano Suzanne Chadwick at Easton’s Academy of Art Museum. Chadwick said that Hannah came to her with a “small, soft voice, having never sung before.” Hannah said she wanted to take voice lessons after being a part of the Avalon Theatre’s Summer Fame Theatre Camp at age eleven. The newspaper article went on to mention that Hannah had sung in our play,The Santa Diaries, when a special part was written to include her voice. Nice to get that recognition for Hannah and for our play which raised over $31K for the Avalon Foundation. Those funds go to support many Avalon Theatre projects including the kid’s summer theater camps. We are so proud of what The Santa Diaries did to support the arts in our local community and we are proud that Hannah Zerai was part of that team effort. This summer Hannah has been accepted to the Peabody Institute’s Classical Singers Workshop and Summer Vocal Academy. We’ll all be watching you, Hannah, wherever your talents take you. This entry was posted in Acting, Carnegie Hall, Christmas, Memoir, New York City, Uncategorized and tagged Academy Art Museum, Avalon Theatre, Hannah Zerai, Laura Ambler, Mala Burt by Mala Burt. Bookmark the permalink.